Scissors are hand-operated shearing tools. A pair of scissors consists of a pair of metal blades pivoted so that the sharpened edges slide against each other when the handles (bows) opposite to the pivot are closed. Scissors are used for cutting various thin materials, such as paper, cardboard, metal foil, cloth, rope, and wire. A large variety of scissors and shears all exist for specialized purposes. Hair-cutting shears and kitchen shears are functionally equivalent to scissors, but the larger implements tend to be called shears. Hair-cutting shears have specific blade angles ideal for cutting hair. Using the incorrect scissors to cut hair will result in increased damage or split ends, or both, by breaking the hair. Kitchen shears, also known as kitchen scissors, are intended for cutting and trimming foods such as meats. Modern scissors are often designed ergonomically with composite thermoplastic and rubber handles which enable the user to exert either a power grip or a precision grip. The noun scissors is treated as a plural noun, and therefore takes a plural verb (e.g., these scissors are). Alternatively, the tool is referred to by the singular phrase a pair of scissors. The word shears is used to describe similar instruments that are larger in size and for heavier cutting. These shears are thought to date to the 2nd century A.D. and come from a Roman settlement in Trabzon, Turkey. The style of the "Egyptianizing" metal inlay designs suggests that they were made to imitate actual Egyptian art. When closed, the dog and cat figures at the tips come face to face. The earliest known scissors appeared in Mesopotamia 3,000 to 4,000 years ago. These were of the 'spring scissor' type comprising two bronze blades connected at the handles by a thin, flexible strip of curved bronze which served to hold the blades in alignment, to allow them to be squeezed together, and to pull them apart when released. Spring scissors continued to be used in Europe until the 16th century. 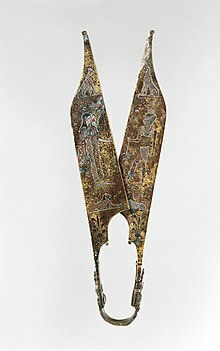 However, pivoted scissors of bronze or iron, in which the blades were pivoted at a point between the tips and the handles, the direct ancestor of modern scissors, were invented by the Romans around 100 AD. They entered common use in not only ancient Rome, but also China, Japan, and Korea, and the idea is still used in almost all modern scissors. During the Middle Ages and Renaissance, spring scissors were made by heating a bar of iron or steel, then flattening and shaping its ends into blades on an anvil. The center of the bar was heated, bent to form the spring, then cooled and reheated to make it flexible. The Hangzhou Zhang Xiaoquan Company in Hangzhou, China, has been manufacturing scissors since 1663. William Whiteley & Sons (Sheffield) Ltd. was producing scissors by 1760, although it is believed the business began trading even earlier. The first trade-mark, 332, was granted in 1791. The company is still manufacturing scissors today, and is the oldest company in the West to do so. Pivoted scissors were not manufactured in large numbers until 1761, when Robert Hinchliffe of Sheffield produced the first pair of modern-day scissors made of hardened and polished cast steel. His major challenge was to form the bows; first he made them solid, then drilled a hole, and then filed away metal to make this large enough to admit the user's fingers. This process was laborious, and apparently Hinchliffe improved upon it in order to increase production. Hinchliffe lived in Cheney Square (now the site of Sheffield Town Hall), and set up a sign identifying himself as a "fine scissor manufacturer". He achieved strong sales in London and elsewhere. During the 19th century, scissors were hand-forged with elaborately decorated handles. They were made by hammering steel on indented surfaces known as 'bosses' to form the blades. The rings in the handles, known as bows, were made by punching a hole in the steel and enlarging it with the pointed end of an anvil. In 1649, in Swedish-ruled Finland, an ironworks was founded in the village of Fiskars between Helsinki and Turku. In 1830, a new owner started the first cutlery works in Finland, making, among other items, scissors with the Fiskars trademark. A pair of scissors consists of two pivoted blades. In lower-quality scissors, the cutting edges are not particularly sharp; it is primarily the shearing action between the two blades that cuts the material. In high-quality scissors, the blades can be both extremely sharp, and tension sprung – to increase the cutting and shearing tension only at the exact point where the blades meet. The hand movement (pushing with the thumb, pulling with the fingers) can add to this tension. An ideal example is in high-quality tailor's scissors or shears, which need to be able to perfectly cut (and not simply tear apart) delicate cloths such as chiffon and silk. Children's scissors are usually not particularly sharp, and the tips of the blades are often blunted or 'rounded' for safety. Mechanically, scissors are a first-class double-lever with the pivot acting as the fulcrum. For cutting thick or heavy material, the mechanical advantage of a lever can be exploited by placing the material to be cut as close to the fulcrum as possible. For example, if the applied force (at the handles) is twice as far away from the fulcrum as the cutting location (i.e., the point of contact between the blades), the force at the cutting location is twice that of the applied force at the handles. Scissors cut material by applying at the cutting location a local shear stress which exceeds the material's shear strength. Some scissors have an appendage, called a finger brace or finger tang, below the index finger hole for the middle finger to rest on to provide for better control and more power in precision cutting. A finger tang can be found on many quality scissors (including inexpensive ones) and especially on scissors for cutting hair (see hair scissors pictured below). In hair cutting, some claim the ring finger is inserted where some place their index finger, and the little finger rests on the finger tang. For people who do not have the use of their hands, there are specially designed foot-operated scissors. Some quadriplegics can use a motorized mouth-operated style of scissor. Most scissors are best-suited for use with the right hand, but left-handed scissors are designed for use with the left hand. Because scissors have overlapping blades, they are not symmetric. This asymmetry is true regardless of the orientation and shape of the handles: the blade that is on top always forms the same diagonal regardless of orientation. Human hands are also asymmetric, and when closing, the thumb and fingers do not close vertically, but have a lateral component to the motion. Specifically, the thumb pushes out from the palm and the fingers pull inwards. For right-handed scissors held in the right hand, the thumb blade is closer to the user's body, so that the natural tendency of the right hand is to force the cutting blades together. Conversely, if right-handed scissors are held in the left hand, the natural tendency of the left hand would be to force the cutting blades laterally apart. Furthermore, with right-handed scissors held by the right hand, the shearing edge is visible, but when they are used with the left hand, the cutting edge of the scissors is behind the top blade, and one cannot see what is being cut. Some scissors are marketed as ambidextrous. These have symmetric handles so there is no distinction between the thumb and finger handles, and have very strong pivots so that the blades simply rotate and do not have any lateral give. However, most "ambidextrous" scissors are in fact still right-handed in that the upper blade is on the right, and hence is on the outside when held in the right hand. Even if they cut successfully, the blade orientation will block the view of the cutting line for a left-handed person. True ambidextrous scissors are possible if the blades are double-edged and one handle is swung all the way around (to almost 360 degrees) so that the back of the blades become the new cutting edges. U.S. Patent 3,978,584 has been awarded for true ambidextrous scissors. Kitchen scissors or kitchen shears For food preparation, but often used for a variety of other purposes. Today, kitchen scissors are usually made from stainless steel for food hygiene and oxidization-resistance reasons. They often have kitchen functionality (other than cutting) incorporated, such as bottle-cap, to fish scale, to crack nuts and bottle-openers built into the handles. Snips for cutting through sheet metal. Hydraulic cutters for cutting heavy sheet metal, often in traffic collisions. Sometimes referred to by the genericized trademark "Jaws of Life". Trauma shears, or "tuff cuts" for use in emergency medical response and rescue should it be necessary to cut off clothing. The rounded tips are designed to slide across the patient's skin without causing injury. All purpose, or Crafting scissors With long blades and pointy tips, designed to cut long, straight, smooth cuts in a variety of materials, as well as to get into small areas with the tips. In sewing applications they are primarily used for non-fabric cutting applications, such as cutting out paper patterns. Applique scissors An offset handle and paddle-shaped blade pushes away the bottom layer of fabric for controlled cuts close the stitching. Designed to cut/trim close to the fabric while protecting it from damage, and used for applique work and rug making. Button hole scissors Adjustable, short-bladed, heavy-duty scissors for opening button holes. Dress-makers shears Dressmaker's shears have a long blade (typically 7–10"), to facilitate cutting out fabric. Blades are tapered, with one pointed and one rounded tip; the blunt tip prevents fabric from snagging on seams and threads. Blades have a "knife edge": the top blade is set at an acute angle which allows them to cut through fabric easier than scissors. More heavy-duty than general scissors, the bottom blade sits flush on the table- making it easier to cut accurately through fabric. Embroidery snips Small scissors without loopholes for the fingers, which have a fine pointy tip, designed to get close to the fabric without damaging it. These snips feature a curved blade, to facilitate getting as close as possible to the base of a thread without damaging the garment. Pinking shears for cutting cloth and producing a serrated edge so that the fabric does not fray. Sewing chatelaine scissors Chatelaine is a French term meaning "mistress of a castle, chateau or stately home", and dates back to the Middle Ages. It refers to an ornamental clasp or hook from which chains were hung from the waist, holding perhaps, a purse, watch, keys, scissors or thimble case. The sewing chatelaine became a popular ornamental appendage worn by Victorian ladies at their waist, but disappeared when fashion changed and skirts were no longer full and long. Sewing chatelaines are now produced and worn as pendants around the neck. Tailor's scissors Designed to cut through heavy-duty materials like leather or multiple layers of fabric. Generally shorter in length (5″ blades are typical), with thicker blades that feature precision-ground knife-edges which cut all the way to the tip. Due to their ubiquity across cultures and classes, scissors have numerous representations across world culture. Numerous forms of art worldwide enlist scissors as a tool/material with which to accomplish the art. For cases where scissors appear in or are represented by the final art product, see Commons:Category:Scissors in art. Dead Again is a 1991 film starring Kenneth Branagh and Emma Thompson in a thriller revolving around repressed memories of scissors. Edward Scissorhands is a 1990 film starring Johnny Depp as a young man who has hands made of multiple pairs of scissors. Running with Scissors is a 2006 film based on the memoir of the same title. The game Rock-paper-scissors involves two or more players making shapes with their hands to determine the outcome of the game. One of the three shapes, 'scissors', is made by extending the index and middle fingers to mimic the shape of most scissors. In the horror game series, Clock Tower, there is a character called Scissorman, who has a variety of identities as the main antagonist throughout the series. Scissorman is a demonic serial killer with a giant pair of scissors and will kill anyone without showing even a sign of mercy or remorse. Augusten Burroughs' 2002 memoir Running with Scissors spent eight weeks on the New York Times best seller list. The book was later adapted into a film. Running with Scissors is the title of a 1999 album by "Weird Al" Yankovic. The song "The Tailor Shop on Enbizaka (円尾坂の仕立屋 Enbizaka no Shitateya)" from Vocaloid producer Akuno-P tells a story about a tailor that kills a man and his family, whom she mistakes for her unfaithful lover and his three mistresses, using her sewing scissors. The XTC song "Scissor Man", later covered by Primus. "Save Your Scissors" – song by City and Colour. The song "Scissors" by American Rock Band "Slipknot"
Scissor kick (strike), a generic martial arts term for any of a number of moves that may resemble the appearance or action of a pair of scissors. Bicycle kicks in football are sometimes known as 'scissor kicks'. Swimming strokes including the sidestroke incorporate a leg movement often known as a 'scissor kick'. Scissors have a widespread place in cultural superstitions. In many cases, the specifics of the superstition may be specific to a given country, region, tribe, religion or even situation. In parts of North Africa, it was held that scissors could be used to curse a bridegroom. When the bridegroom was on horseback, the person enacting the curse would stand behind him with the scissors open and call his name. If the bridegroom answered to his name being called, the scissors would then be snapped shut and the bridegroom would be unable to consummate his marriage with his bride. In Pakistan, some believe that scissors should never be idly opened and closed without purpose. This is believed to cause bad luck. In New Orleans, some believed that putting an open pair of scissors underneath your pillow at night was a sound method for sleeping well, even if one is cursed. It is believed in some Eastern European countries that leaving scissors open causes fights and disagreement within a household. It is believed in China that giving scissors to a friend or loved one is to be cutting ties with them. Scissors have been used in the sciences for various purposes, including descriptions of animals or natural features. The scissor-tailed flycatcher of North and Central America. The scissor-tailed kite, a bird that is widespread throughout Africa. The scissor-tailed nightjar of South America. The scissor-tail rasbora, several species of fish that are commonly used for freshwater aquariums. Hemostat resembles a pair of scissors, but is used as a clamp in surgery and does not cut at all. Nippers cut small pieces out of tile. Pliers used for holding and crimping metal or wire. ^ "Shears: Roman Period". Metropolitan Museum. n.d. Retrieved 2018-07-18. ^ Zoom Inventors and Inventions. Enchanted Learning. Retrieved 2010-11-05. ^ Sudworth, John (2013-04-22). "The scissor-maker that has cut through Chinese history". BBC News. ^ "History". William Whiteley & Sons. Archived from the original on 2014-12-08. Retrieved 2015-01-20. ^ Leader, Robert Eadon (1901). [Reminiscences of] Sheffield in the Eighteenth Century. Sheffield: The Sheffield Independent Press Limited. pp. 69–70. ^ Encyclopedia of Superstitions 1949 – Edwin Radford, Mona A. Radford – Google Boeken. Books.google.com. Retrieved 2012-02-28. ^ DJPianz (2011-05-04). "Superstitions around the world: Pakistan – Scissors". Worldsuperstitions.blogspot.com. Retrieved 2012-02-28. ^ "NEW ORLEANS SUPERSTITIONS (1886) by Lafcadio Hearn". Sacred-texts.com. Retrieved 2012-02-28. ^ Aquaticcommunity. "Scissortail – Rasbora trilineata". Aquaticcommunity.com. Retrieved 2012-02-28. ^ "Scissor Tail Rasbora – Rasbora trilineata". Fishlore.com. Retrieved 2012-02-28. This page was last edited on 17 March 2019, at 18:45 (UTC).